Mexican food is one of my all time favorite types of food. Cheese, tortillas, salsa, more cheese, I can’t get enough. Total comfort food as far as I’m concerned. With all of the, shall we say, less than health conscious desserts I’ve been hitting hard lately, I decided I really needed to start working some healthier recipes into my blog repertoire. Enter quinoa. I’ve only discovered quinoa in the last few years and I absolutely love it. It’s a whole grain and a complete protein so it’s a great addition to vegetarian dishes to give them a protein boost. Kind of like tiny little seeds with the al dente chewiness of noodles. Very simple to cook, you prepare it pretty much the same as you do rice. You can even use a rice cooker to cook it if you like. I’ve always cooked rice (and now quinoa) just in a pot with water so I can’t give pointers on the rice cooker method, but I can tell you it is not at all difficult to cook the old fashioned way. Also, I can’t really justify buying an appliance that I have to find storage space for when it’s only useful for cooking one or two things…unless it’s a waffle iron…because everyone needs waffles in their life. 😛 Maybe I’m just unaware of all sorts of hidden talents of rice cookers. Anyone pro-rice cooker arguments out there? I’m not sure if this is strange, but I always prefer eating taco salad cold. I think it stems from my grade school days. Taco salad day was second only to hot lunch day as far as cafeteria food went, and they served the taco salad cold. I think pretty much everywhere else I’ve had taco salad serves the meat part warm with all of the salad fixings chilled. That always seemed strange to me because then the taco meat wilts the lettuce and you’re left with a wilted, slightly warm, not-so-salady salad. If the meat is cooked and then chilled, everything stays nice and crisp. If you want to serve it hot, simply prepare as directed in the recipe, then, just before you’re ready to serve it, heat up your tortilla shells and toss the salad in a hot skillet for 5-10 minutes, or just until heated through. With Cinco de Mayo right around the corner, it’s the perfect time of year to give this recipe a try! 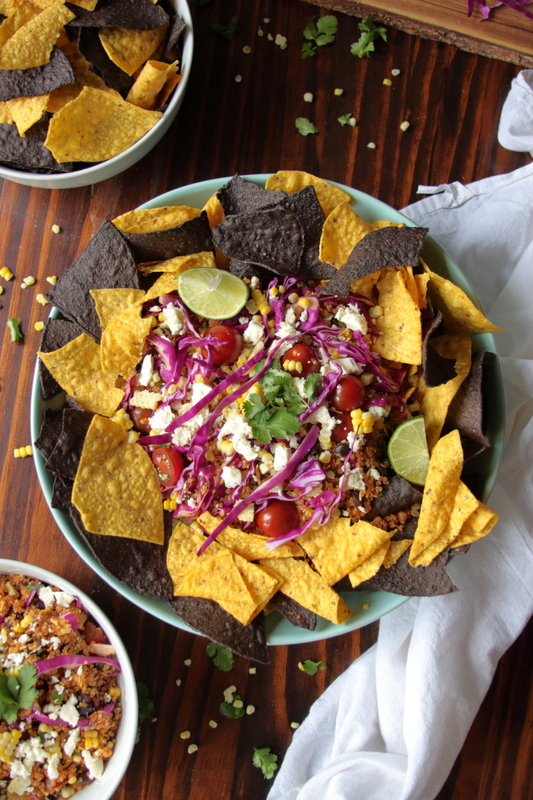 This version of a classic taco salad is kicked up a few notches on both the flavor and health scale. 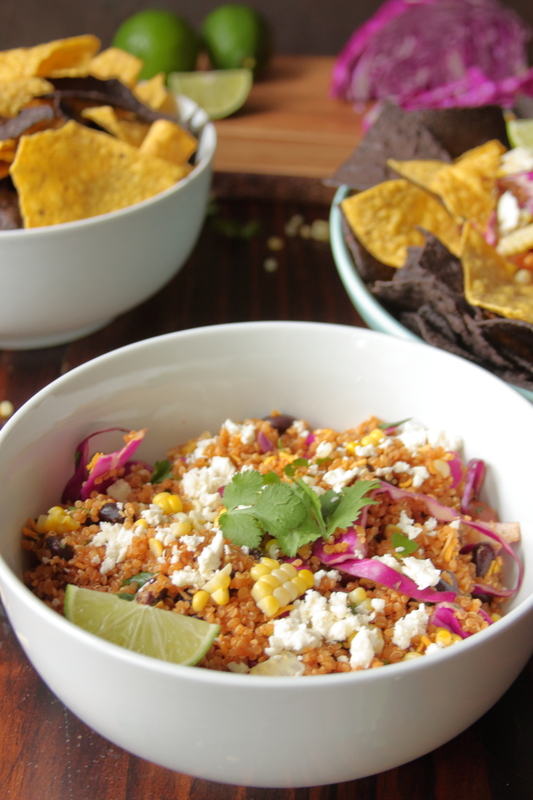 Packed with fresh, colorful veggies and super healthy quinoa, you can serve it hot in tortillas, chilled with tortilla chips or straight out of a bowl. 1 packet taco seasoning 1 oz/28 grams, or see Recipe Notes section for link to Mexican seasoning recipe. 1 finger hot pepper seeds and ribs removed and finely chopped. can substitute jalapeno pepper. 1 pint cherry tomatoes halved. I used sweet brown cherry tomatoes. 1 finger hot pepper finely chopped, can substitute jalapeno. Rinse and drain the quinoa. Add to a medium sauce pan and stir in vegetable broth, garlic, taco seasoning and finger hot pepper. Bring to a rapid boil then reduce heat to bring to a low simmer. Cover and cook for 12-15 minutes or until most of the broth is absorbed and quinoa is tender. Let quinoa cool slightly, then refrigerate until chilled for 3 hours or overnight. To cook the corn, bring a large pot of salted water to a rapid boil. Shuck the corn to remove all husks and silk. Add the corn to the boiling water, bring water back to a boil, and cook for 5 minutes. Remove corn from pot and when cool enough to handle, cut kernels off of the cobs. 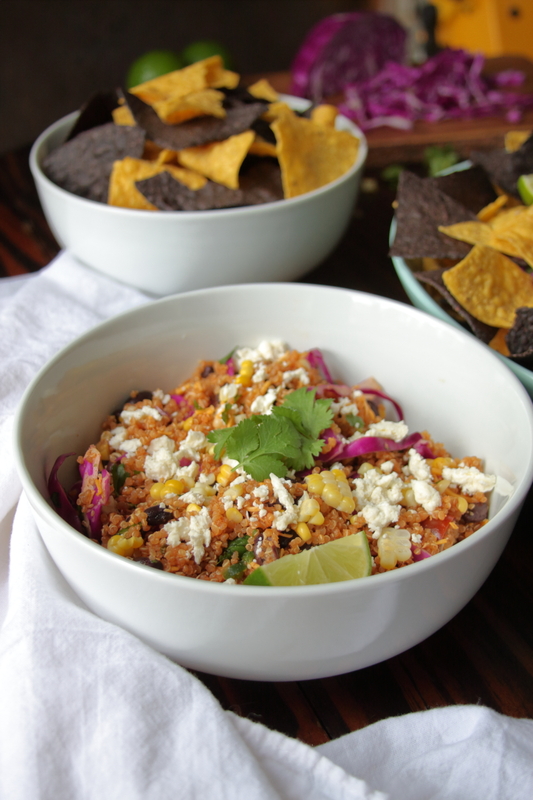 In a large bowl, add the chilled quinoa, corn, beans, tomatoes, cheddar, pepper, cilantro and 2/3 of the cabbage. Stir to combine all ingredients. Season with cumin, adobo, salt and pepper to taste. Top with queso fresco, additional cilantro, the remaining cabbage, and serve with lime wedges and tortilla chips. Any die-hard rice cooker fans out there? Do you prefer your taco salad hot or cold? 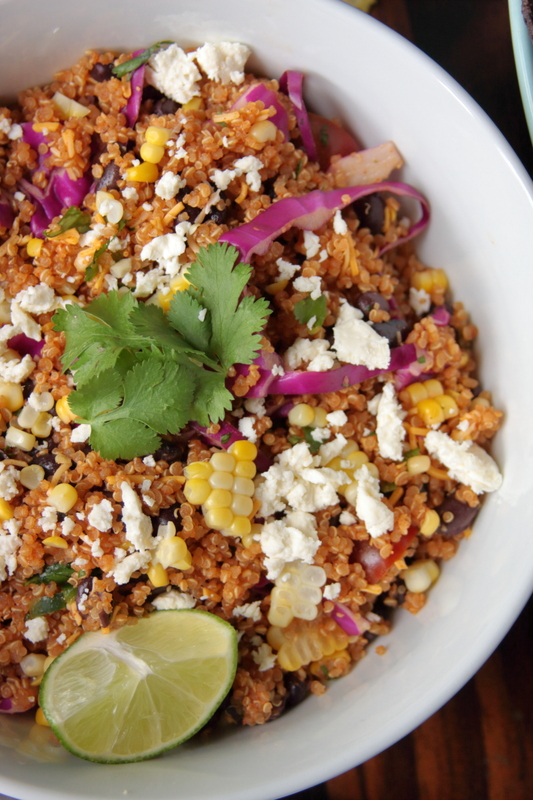 What’s your favorite quinoa dish? Comment below!